Hello, my name is John Stillwell and I am going to help you get started playing on your new Native American style flute. I’ve been making and playing the Native American style flute for more than fifteen years. I am entirely (or almost entirely) self-taught. But I now realize that if I had been given a lesson or two along the way my playing would have progressed that much faster. So I thought that it might help you if I put down in writing what I have learned. In this first lesson I am not going to try and teach you about notes, scales, intervals, tempo, theory or any of the other technical facets of music making. Instead, you are just going to learn how to make beautiful sounds on your Love flute. I imagine you feel excited and a bit nervous if this is your first experience with the Native American flute. If you’re like me (and most other people) you may have tried various other instruments in school and like me you gave up playing them up at some point. Maybe you studied piano or one of the other complicated and difficult modern, highly technical musical instruments. Unlike the Native American style flute these instruments were developed over centuries to meet the needs of professional musicians. They are very difficult to learn to play. Rest assured it is easy to learn how to play the Love flute. Just looking at your Native American flute you can see that it is not a complicated instrument. This lack of complexity means that this type of flute is easy to play. So relax and make a little mental and emotional effort to let go of any anxieties and inhibitions that you may be feeling. These feelings are a by-product of your childhood learning experiences. Now that you are and adult it is going to be different. You can go at your own pace and in private. Nobody is watching or judging what you are doing. I guarantee you can easily learn to play and will enjoy playing your Native American style flute. Lets consider the word play for a moment. Play is not the same as ‘work’, ‘study’ or ‘practice’. The word play implies or should imply spontaniety, relaxation and enjoyment. This is what the experience of making music should and can be. This is what making music on your new Love flute will be - play. At this beginning stage, you may experience a little frustration that your fingers can’t do everything you want them to. 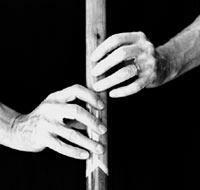 Your fingers will need a little time to get used to dancing on the holes of the flute. This process is called acquiring muscle memory. If you are patient with yourself, your fingers and neural network will actually enjoy this learning. Don’t struggle; don’t try to take on too much at one session. Play around. If you get into the right inner space this playful enjoyment will continue to grow for as long as you play the Love flute. Don’t allow yourself be judgmental or frustrated. If you do begin to have some negative feelings - give yourself permission to relax, then take a few breaths or whatever works for you. Let go of those frustrations. They are left over from of some negative conditioninin your childhood. They don’t have to be there. They only impede your learning. If this doesn’t work just put down the flute for a while until you’re in a better mood. Before you start playing lets learn a little bit about your flute. The Native American flute is a tube divided into two sections by a solid area of wood inside the tube. This solid area is called the plug and it separates the slow air chamber - at the mouth end of the flute - from the sound chamber or bore at the far end of the flute. The bore is where the six tone holes are. Take the bird off the Love flute by loosening the buckskin band and sliding the bird back off the flute. Now, you can see two holes on top of the flute connected by a groove cut into the top of the flute. The hole closest to the mouth end is where the air you blow into the flute comes out of the slow air chamber. The other hole opens into the bore or sound chamber of the flute. The groove connecting these two holes is called the flue. The two holes aren’t actually connected until the bird is on top of the flute. When the bird is in place the flue allows air to leave the slow air chamber in a controlled and focused stream and directs it against the splitting edge of the second hole. This second hole is called the true sound hole. When the stream of air hits the splitting edge at the far side of the true sound hole it is divided into two parts. One part of the air diverted into the sound chamber or barrel of the flute and starts a vibration in the barrel that makes sound. Put the bird back on the Love flute over the flue and tighten it down. The bird must be tied tightly on the flute or air can escape out the sides of the flue and this will cause disturbances in the sound of the flute. The bird should be centered on the hole. The front edge of the bird should be just in back of the rear or back edge of the sound hole. How far back depends on the particular flute. A good starting point is about a 32nd of an inch or the thickness of a plastic credit card. Now let’s blow into the flute. Don’t try to cover the holes with your fingers - just blow gently into the mouth hole of the Love flute. Does it make a sound? Good. Now we know that the flute works and you can make a sound. Next, cover the holes on the barrel of the flute with the pads of your fingers. Don’t use the tips of the fingers but the fleshy area under where the nails are. The ring, middle and index finger of the left hand cover the three bottom holes and the ring, middle and index finger of the right hand cover the three top holes. You don't need to use a lot of pressure. The fingers should rest over the holes not press down hard on them. You thumbs are in a comfortable position on the underside of the Love flute. Here is a diagram of a Native American flute with six holes. The mouth end of the flute is at the bottom and the end of the barrel of the flute at the top. This is the way you see the Love flute as you’re looking down when you’re playing. The hole farthest away from you is hole number one. The hole closest to your mouth is hole six. There are six pictures showing the finger position for the six notes we will make. A closed hole (finger down) is shown as a solid black circle. An open hole (finger up) is shown as a circular outline. Cover the holes with your fingers and blow gently into the Love flute. You should hear a clear, sustained sound. Your ear will instinctively know if the sound is right or not. If the flute doesn’t sound right there are two possible reasons. Either you’re blowing too hard or one or more holes aren’t completely covered. Blow again a little softer. Did this make it sound better? If not, it’s a leaky finger. Relax and put some focus on your fingers. Don’t press harder; just shift them around a little. Take the flute from you mouth and move it so that you can see how the fingers are covering the holes. Some people have reported good results if they looked at their hands on the flute in a mirror. Look for any holes that may not be completely covered. Just a tiny opening with cause the leaking of air. Readjust your fingers. Now try blowing again. Keep at it until you hear a clear kind of mellow tone. This tone is the fundamental note of the flute. It is also called the key of the flute. Play around a little with sounding this fundamental note. Puff – puff – puff with your breath from the solar plexus or stomach area not from the mouth. Blow some long slow notes from the solar plexus. Take all your fingers off the holes and put them back on and blow again. Get the feeling of having your fingers comfortably cover the holes. At first this is a rather self-conscious effort. Soon, as muscle memory develops, it will become second nature. Now let's sound a second note. You will do this by lifting the ring finger of your right hand from the hole it is covering. This hole is called the number one hole. Blow into the flute with all holes closed and while still blowing lift the right ring finger. Play around with lifting and lowering this finger making the sound go up and down. You don't have to lift the finger high off the flute. Just enough to let air to escape. If the finger ends up way high over the flute it will have difficulty finding the hole when it comes back down. You now have two notes. Let's add a third note by lifting the middle finger of the right hand after you have lifted the ring finger. One, two, three notes while blowing into the flute with a gentle steady breath. Fundamental note – with all holes closed, second note - by lifting the ring finger and then third note - by lifting the middle finger with the ring finger still up. Pause - keeping the two fingers up and take a breath. Now go back down the notes. Blow the third note, then lower the middle, then the ring finger and with all fingers down you're back to the fundamental. One thing that you need to remember at this stage in your learning is that you don't lift up a finger until the finger below it is up. So you don't lift up the middle finger before the ring finger is up. You don't lift up the index finger before the ring and middle fingers are already up. Now we add another note by lifting the index finger - first note (fundamental all fingers down), second note (lift ring finger), third note (lift middle finger) and fourth note (lift index finger). Let's go on to the left hand and add fifth note. If you have a Native American flute with five holes the ring finger of the right hand will be resting on the flute not over a hole. With a six-hole Ancient Territories Native American style flute we are not going to lift up the ring finger of the right hand but leave it down on the hole. You will raise the middle finger of the left hand next. So you push the air up from the solar plexus, up and out the mouth and into the flute to sound the fundamental note. Then raise the right hand ring finger, then middle, then index finger. Next (leaving the left hand ring finger down of over the fourth hole) you raise the middle finger of the left hand. You have sounded five notes including the fundamental. This completes a pentatonic (five note) scale. A scale is like a little five note tune. There are lots of different possible scales. The scale that you are playing is called the Mode One Minor Pentatonic scale. You will sound the next note by lifting up the index finger of your left hand. This sixth note is your fundamental note again but one octave higher than where you started. See Flute Keys and Notes . Of course, you don't need to know what fundamentals, scales; octaves or notes are to make music. I'm using a little bit of musical terminology here and if you are not familiar with the terms don't worry because you are making music anyway. Now, play with letting your fingers dance up and down the holes of the flute. Do this at different rates of speed. Change the volume by blowing harder or softer. Play, discover and enjoy the world of music.